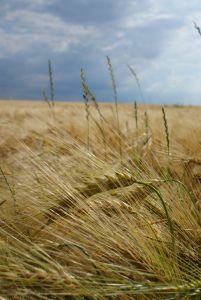 Triticum. Pliny says, that thecorns of Wheat roasted in an iron pan and eaten, are a speedy remedy for those who are chilled with cold. The oil pressed from wheat, heals tetters and ring-worms; and Galen says, he has known many cures performed by it. Matthiolus recommends the same to be put into hollow ulcers to heal them. It is good for chilblains in the hands and feet, and to make the skin smooth. Slices of Wheat bread soaked in warm water, and applied to the eyes that are red and inflamed, or blood�shot, cures them. The flower of Wheat boiled in vinegar cures the shrinking of the sinews, says Pliny; and mixed with vinegar, and boiled, it heals freckles, pimples, and spots on the face. Wheat flour mixed with the yolk of an egg, honey and turpentine, draws, cleanses, and heals any boil, sore, or foul ulcer. The bran of Wheat meal steeped in vinegar and bound in a linen cloth and rubbed on the places that have scurf, scabs, etcetera, it will take them away. Wheat bran boiled in good vinegar, and applied to swollen breasts, reduces them, and all inflammations. Boiled in water into a thick jelly, it checks spitting of blood; and boiled with mint and butter, it relieves the hoarseness of the throat.